The Church of England has voted in favor of the ordination of women bishops at its General Synod on July 14, after two decades of heated debate and discussion that has provoked serious divisions within its membership. "Today is the completion of what was begun over 20 years ago with the ordination of women as priests. I am delighted with today's result," said Archbishop of Canterbury Justin Welby, spiritual leader of the world's 80 million Anglicans. The decision marks a significant break with the two-thousand year old Christian tradition that is preserved by the Catholic and Orthodox Churches, which count for more than half of all Christians. The General Synod is the Church’s governing body, and for the motion to succeed it required a two-thirds majority in the synod’s three houses: the House of Bishops, the House of Clergy and the House of Laity. House of Bishops: 37 in favor, 2 against, 1 abstain. House of Clergy: 162 in favor, 25 against, 4 abstain. House of Laity: 152 in favor, 45 against, 5 abstain. This shows that a total of 351 members of the Synod's three different houses had voted in favor of the measure, while 72 voted against and 10 abstained. The General Synod had voted narrowly against the ordination of women as bishops on 20 November 2012, with the laity vote being decisive on that occasion (132 in favor and 70 against), but the yes vote this time round did not come as a great surprise. The decision comes after years of heated debate and discussion within its fold. The Church of England has had women priests since 1994, and this already caused serious divisions in the Church. Indeed, some 4-500 priests and thousands of lay faithful decided to join the Roman Catholic Church, and many are now serving as priests, including hundreds who are married. Even before today’s decision, already other Churches in the Anglican Communion in Australia, New Zealand, the USA and Southern Africa have ordained women bishops, but the Church of England’s decision takes on particular significance because of its historic and leading position in the worldwide Anglican Communion which has some 80 million members. Its decision marks a significant break with the mainline Christian tradition of the Catholic and Orthodox Churches which constitute the majority of the Christian community. It appears to distance even further the possibility of visible unity with the Catholic Church, something that had appeared as a real possibility in the decades immediately after the Second Vatican Council (1962-65). Popes Paul VI, John Paul II, Benedict XVI and Francis have all said that the ordination of women as priests and bishops cannot be reconciled with the Christian tradition and doctrine. The Church of England decision still needs the approval of both Houses of Parliament. It will also have to receive the Royal Assent from Queen Elizabeth II. This article first appeared on the Vatican Insider and is re-published here with their permission. This might actually help evangelization, as I expect millions more Anglicans to join the Catholic Church and Orthodox churches over the next 50 years. It's not just this decision, which appears partially the result of gerrymandering (one doesn't get such vote swings without maneuvering many people out of he process), but the craven way points of Truth are decided in this communion, across the board. It simply has no way of resisting the dominant secular culture. This particular decision was minor after they departed from infallible truth on women priests. But, I guess is is just the continued workings out of the original fault of Henry VIII. Oh please, Tim--"infallible truth on women priest"?! There's no infallibility about this seems like we all debated this a couple of years ago on this website). And what's with the language of "craven way" and the boiler plate denunciation of "dominant secular culture"? As for gerrymandering, the College of Cardinals is a prime example of that, isn't it? 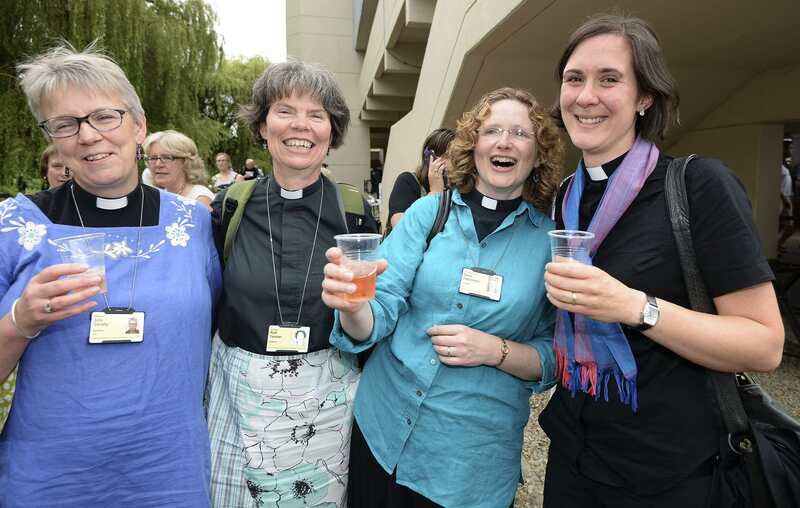 I rejoice that women who are called to ministry are able to participate fully in the life of the Anglican Church. We'll get there one day. Vince - Divorce, contraception, abortion, women priests, gay priests, gay marriage. And now, we are seeing a move for euthanasia. I suppose that will be decided by vote as well. Or maybe several rounds of votes. No need to even argue based on scripture or tradition or the further break with Catholics and Orthodox. You might find this sort of thing the way to truth. Good luck to you on that strategy. By "vote"? Don't the bishops and cardinals vote in conclaves, annual meetings, etc.? I'm not certain what you mean. Are you arguing that Anglicans don't engage with scripture in discerning matters of faith? That isn't true. Vince - Since the last vote in Nov 2012, at least 25 lay people switched their votes, or, more likely, were replaced. It would be pretty naive to think they did this because they found a new scripture verse previously unseen. Also, the votes in a Conclave relate not to doctrine but to elections of people (the pope). In the Anglican (and many other Protestant denominations, and I think, in Islam, there are doctrinal votes. This is not the way to Truth. Not exactly, Vince. You have linked to 10 votes in VCII that were hardly doctrinal. The first 4 were: 1) “does the preparatory schema need revision” or 2) should Mary be included in the schema in the Church (a specific document), or 3) whether “episcopal consecration was the highest grade of the sacrament of Holy Orders”, or 4) is every consecrated bishop a member of the College of bishops” etc. You might claim that the 5th definition on Collegiality approached doctrine - “That this College of Bishops succeeded the College of Apostles in its role of teaching, sanctifying, and caring for souls, and that this college, together with its head, the Roman Pontiff, and never without him (whose primacy over all bishops and faithful remained complete and intact), enjoyed full and supreme power over the Universal Church” but it again just affirmed the final authority in the pope for all doctrinal questions. If you mean a vote of one – the pope – you will be arriving at the Petrine ministry. That is how it is done in the RCC. In any case, for the more democratic/procedural Anglican communion - was the vote in 2012 true or was the one this week true. Does it really matter? There is no Petrine charism. Vince - your links are all progressive/dissident sites with political interpretations of votes on documents, never on settling a specific doctrinal issue. My "complaint" (hardly a sufficient descriptor) is that the Anglican system has a completely political way of determining doctrinal truth - repeated votes on doctrine, gerrymandering or pressure on those who vote against the political avant-garde (Carey and Tutu are pushing Euthanasia presently) - that is completely unlike the Petrine charism. There are procedural votes in any organization, including votes on documents and committee reports. But, doctrine is known very differently in the RCC. Maybe, you can try to find some doctrinal issue (say abortion or contraception or women priestesses, etc.) that has gone through several votes on the teaching to determine the doctrine. Otherwise, you are just missing the whole difference. My main complaint with the Anglican Church is that is was founded on a lie, backed up by violence, and abandoned the noble millennium of faithful English Orthodoxy. For centuries, some holy reformers had been trying to find the way back to orthodoxy for the community, but the church went off the rails in the C20., and is now collapsing altogether. Tim--I thought the AMERICA website as done positing comments about "liberal" and "conservative" (although the James Carville story kind of breaks that policy). My links were to "factoid" sites that simply listed the Vatican II document and the vote count. I have no idea what you mean by "doctrine" if you don't find the "Dogmatic Constitution of the Church" and "Dogmatic Constitution on Divine Revelation" to be about doctrine. As for gerrymandering, the College of Cardinals is one of the least representative bodies around. I'm grateful that you finally explained your problem with Anglicans: you don't think they are a legitimate Christian denomination and there is nothing they can do that would be correct (except move en bloc into the RCC). Vince - it is one thing to accept ("placet") a document such as a Dogmatic Constitution and another to vote up or down on a single doctrinal question (to settle a doctrinal controversy). There is a big difference in asking fellow bishops to accept or reject a broad document that is intended to reiterate and clarify accepted doctrine or adopt new procedures and consciously changing course (accompanied by congratulatory speeches & emphasizing the courage the novelty or deviation required). Outside revisionist circles, infallibility (at VC I) is seen as a clarifying reiteration of long-held teaching (all those anathemas throughout history) to meet the specific type of rationalist mindset of the time. I'm sure you don't think the Nicene Creed is thought to be less definitive teaching just because the infallibility term or wording was not used in the fourth century. In the RCC, the CDF or the pope generally deals directly with specific doctrinal controversies. I think you agree on this, even if you don't like the outcomes. I know you think your links are just giving the facts, but here is how the 1st topic describes the Catholic Church before VCII in your last link: "The liturgy of the Western Catholic Church, because of a dead Latin language totally incomprehensible to the people, was exclusively an affair of the clergy; it was, because of the petty rules that governed it, conducive to a magical kind of thinking; religious feeling was endangered through an overemphasis on pompous high masses, while private masses prevented a sense of community and led to one-sidedness, to a neglect of preaching." Not exactly a non-partisan characterization and certainly not how my parents and grandparents viewed their masses before 1960. You're grasping Tim. Are you denying the votes were taken at Vatican I & II? I Those bishops gathered were voting on doctrinal matters.The two links (the first is a social science data bank) report those votes. That was my sole point to refute your claim that the Anglican Church is deficient because they vote on doctrinal matters. You will, as usual, have the last word. . .
What defect is it that makes people consider women unfit for leadership in religious matters? No defect of any type, but one of mission and vocation. And why would there be this mission and vocation difference? According to Bruce, above, the problem with women is the way men feel about them. Marie - it is only those who demand women be priests that need to determine some sort of defect or inferiority. It is they who are hyper-clerical in their thinking. The current orthodox Catholic understanding, especially as reflected in St. JPII's Theology of the Body, in no way sees this as a superiority/inferiority zero sum game. The orthodox teaching sees gender as a defining aspect of our human nature, and the complementarity of the sexes (in biology, in mission, in roles and in representations) as God's way of teaching humanity something integral to our nature. So, Jesus, ever radical in His mission, 1) selected a male body for the incarnation and a 2) female person to consent for all mankind ("tainted nature's solitary boast") and 3) the highest human in heaven (Queen) that is not God. 4) He selected only men for His bishops, and as representatives of Himself in the Eucharistic act. 5) The Holy Spirit, through the Magisterial teaching charism, has definitively reiterated this division. I do not think we can understand the full meaning of the gender roles and so we take this teaching on faith. The Holy Spirit has spoken. The non-Christian world has a completely different idea of gender, seeing it as some form of competition that must be eradicated, and a difference that must be eliminated. So, there is the move to separate our godlike procreative biology from our unitive pleasure, and delegitimize even the word complementarity, even to the extreme of promoting homosexuality and blessing abortion. This false understanding of our human nature has infected many Christian denominations, already weakened by their original separation from the See of Peter. It is especially noticeable in the churches who tried for centuries to sail close to the mother ship but who recently jettisoned Scriptural teaching overboard, like the Anglicans. Since I have no personal interest in serving in any of those roles currently reserved for men in the Catholic Church, I am not particularly affected by the idea that women do not belong in these roles. I am of the opinion that men should have to do some things women don't have to do in order to pull their weight, because, God knows, they don't do so when it comes to those things that make daily life pleasant and healthy for anyone other themselves -- if they even do manage to care for themselves. However, I find it difficult to believe that the women serving in the capacity of priests and bishops in the Anglican Church are doing so because they have a feminist (non-Christian, in your words) mission to infiltrate all exclusively male occupations. While I appreciate the symbolism of the male of New Testament times and the woman of New Testament times representing the roles of God and humanity, respectively, I do not think that this symbolism is meant to be definitive of gender roles in all times. Reality is that the fruits of the Industrial Revolution have created a world in which both men and women no longer play complementary roles in order to assure the continuation of the species. These days, individuals interact with manufactured products of all kinds to provide for their sustenance, and this is now what is required in order to thrive. While it is still possible for the occasional couple to live successfully in a pre-Industrial Revolution style, it isolates them from the larger world in a way that does not seem in keeping with the openness of Jesus to the world. I think rather than seeing as doomed those Christian denominations that have adapted to the ways of society in order to continue the mission of spreading The Word, we should consider that they may be inspired by the Holy Spirit in their adjustments to new ways of living. There are many rooms in the Father's house and many approaches to reaching people with The Good News. Marie - I too have no personal vocation for the priesthood, and I am married with kids, so I am practically excluded as well, if not theoretically so. You make some good points about the modified roles following the industrial and subsequent technological revolutions but I think the changes have hardly impacted our nature. My understanding of God does not permit me to think He never contemplated such revolutions. In any case, the Church has spoken and so doubt on this is removed for me. I note that your observation of the deficient role of men would suggest you too see some immutable differences in the sexes. I certainly see apparently innate gender differences in my children. As regards the Anglican priesthood and bishopric, the Catholic position is that they have long been cut off from Apostolic Succession and their orders and eucharist are invalid. So, the women who become priests or bishops are no different from the women ministers in other protestant denominations. The disappointment in their recent decision relates to appearances rather than substance, in my view, although their governance methods are so political. I am less sanguine than you about the likelihood that women priests will forswear feminist activism but I do hope they do good charitable work, oppose abortion (don't hold your breath on that one) and help their fellow Anglicans walk closer to Jesus, as any Christian might. But, as Vince surmised re my position below, the best for Christianity is that as many of them as grace and free will allow should leave that church and join the True Church, now that an en bloc reunion is impossible. I agree that there are differences between males and females that go beyond body parts, however, there was a time when girls and women were not permitted to do all manner of things for which they had talents and skills only because they were female. This judgment on women who lead congregations is more of the same. I fully support the advancement of women in every area that is good for them (my mother was a trailblazing physician when very few women entered Medical School). The role of the priest is a very specific one, like motherhood, ordained by God, with deep religious significance. It is not just a new opportunity, or a new adventure in life. In any case, on questions like this, you have to decide who you will listen to for a definitive answer. Yourself or the Church. I think people should refrain from predicting doom for those faiths that ordain women. It's insulting. You may believe that the Church's position on this matter has some kind of theological basis, but the explanation for not ordaining women is very simple: they find nothing in Scripture or Tradition that calls for the ordination of women. Putting the best face on it, they are being cautious in case there's nothing there for a reason. However, other faiths do see reasons in the life and teaching of Jesus for including women in their leadership. They view exclusion as a cultural artifact of a different kind of time, which I think is a valid perspective. If motherhood is ordained by God, its corollary is fatherhood, not priesthood, in my opinion. I am content to let the Church decide the matter even though I don't think women's ordination would lead to destruction of the Church any more than the acceptance of women as physicians has changed, for good or bad, the way healthcare is practiced. Respectfully, I find it interesting that feminine mystique, relative to Henry VIII and his divorce question, led to the MAKE-UP of Anglicanism and its American off-shoot Episcopalism, and once again feminine mystique regarding ordination as priests and Bishops will most likely lead to Anglicanism's BREAK-UP. That's sad. I thought that the Spirit's healing unction of ecumenicalism was healing the tear in the Body of Christ inflicted by Henry, but apparently not. It's an unhappy twist that it should happen this way, but I think it's inevitable that in the next few years their will be mass Tiber crossings by disillusioned Anglicans and my guess is that Anglicanism will cease to exist by the end of this century. Ecumenicalism will have worked after all - "swimmingly" relative to Tiber crossings. I don't mean to make light of a most serious matter, but the expression seemed to fit. I wish it could have been another way! I agree with your ultimate prediction on Anglicanism, Bruce. However, I don't see how it could possibly last anywhere near the end of this century. It seems to me that Anglicanism has willingly rejected the yearnings of the Holy Spirit in pursuit of the cultural revolution of the contemporary world. The "consecration" of practicing homosexual bishops (Episcopal Church) left no doubt in my mind. Let the fate of the Anglican communion be a warning to the Catholic Church. Hi Carlos - Maybe the disintegration of the Anglican Church already underway will happen well before the end of this century, as you indicate, but no matter when, it is a sad turn of events, rooted in the Church's snub of the movements of the Holy Spirit as you suggested and with which I agree. The non-solution of Henry's lethal "solution" of "ecclesiacide" by divorce from RC Communion with subsequent watering-down of doctrinal and traditional authentic catholicity, has been a relatively slow-working poison, but now galloping through Anglicanism's faltering system non-reversibly. Too bad! There was a better way for this to happen.